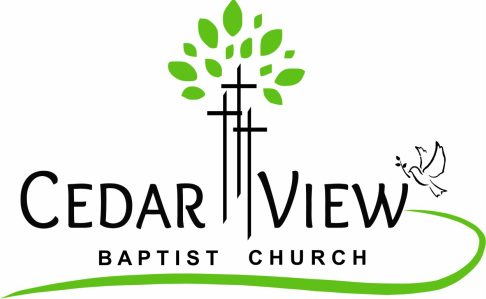 At Cedar View we are actively seeking the Lord's wisdom to carry out ministry to whole families that will reverse the trend of younger generations leaving the church. We believe the home is the key to solidifying the faith of little ones in the kingdom. Parents have a great responsibility to shepherd their children in the teaching of God's Word at home. We want the gospel to be part of normal life and conversation for all families who join with us on mission. By using the New City Catechism and accompanying devotional and through monthly Family Ministry Nights we hope to supply and support parents in this most important endeavor. Furthermore, through the supplication of the saints, God may be gracious in strengthening families for the sake of the church and for the glory of His Name. Contact Kyle Hilleary at Hillearykyle@gmail.com for the schedule or for more information on Family Ministry. During worship services, children from birth through age three are welcome to enjoy safe, loving supervision while playing and learning about Jesus. The church nursery is an exciting and vital ministry in the church—a launching pad for nurturing the faith of the next generation. Here at Cedar View we use "A Sure Foundation: A Philosophy and Curriculum for Ministry to Infants and Toddlers" that is designed to help our nursery be—a place of prayer for young children, a place where they hear foundational Bible stories, and a place where children learn simple truth statements and begin to memorize Scripture as they form their language skills. ​A Sure Foundation is divided into four stages. The Fragrance of the Knowledge of Christ, establishes the philosophy of ministering in infant nurseries and creates on environment centered on prayer for each baby. Young toddlers, 18-24 months, are taught four repeating Bible stories and monthly memory verses along with truth statements about God’s character in The Wonders He Has Done. Older Toddlers, 24-36 months, use His Praiseworthy Deeds curriculum, which reviews the four stories already learned, plus nine more foundational stories and completes the monthly memory verses. Mothers and children 36 months+ are encouraged to enjoy corporate worship.